Every once in a while I get into a mood to take spontaneous, unplanned adventures. We had such a day. 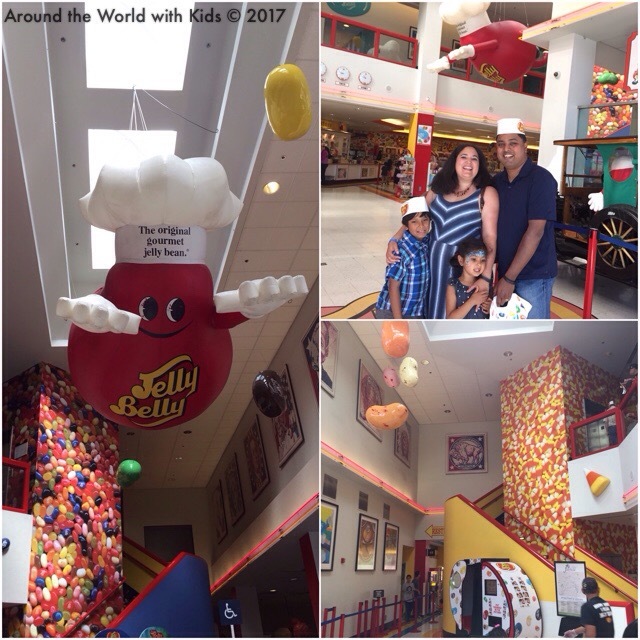 We were driving home after attending a picnic, when my husband said out of the blue, “The Jelly Belly Factory is not to far away. Want to go visit it?” A quick Google search showed we could get there in time for their last tour. 25 minutes later we were parking and heading in for a sweet treat. 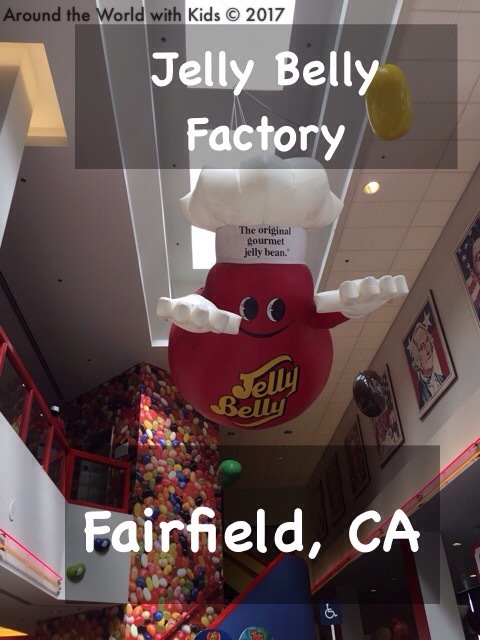 The Jelly Belly factory is located in Fairfield,, CA and have free tours of their factory every day. 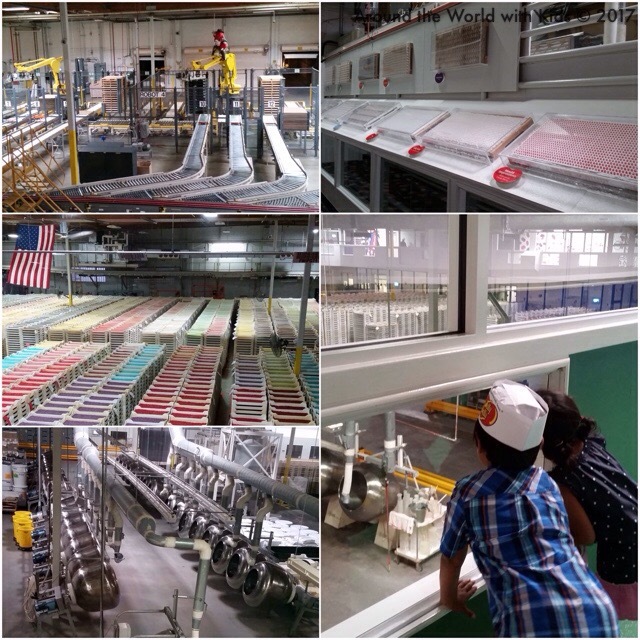 During the week, you have the ability to view the factory at work, and see people actually manufacturing those brilliant little candies. During the weekend, you don’t get to see the actual production, but you get to see more of the facilities. 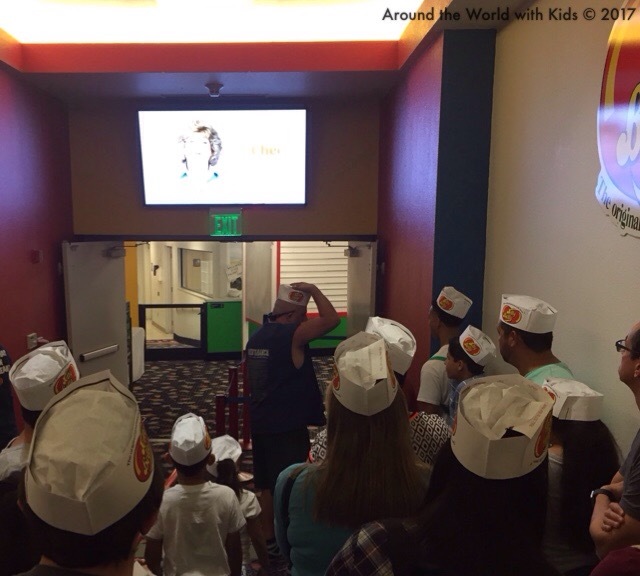 The tour starts with a quick video that tells you the history of the Jelly Belly brand. Then you are given the rules, no running, no flash photography, and wear your Jelly Belly hat at all times! 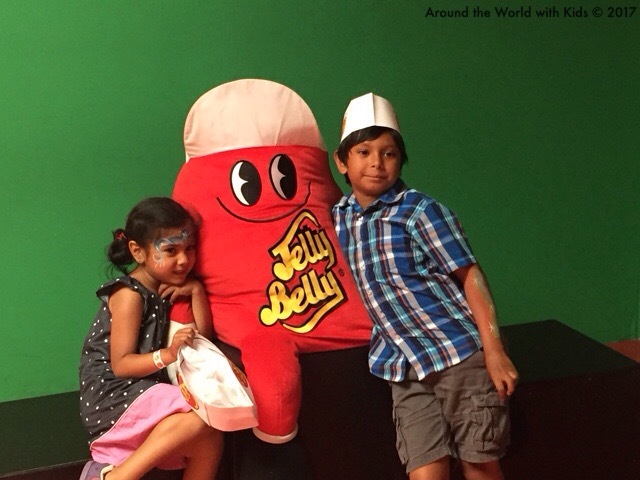 Once you have your hat (and a sample Jelly Belly), they leave you to walk through the self-guided tour. The tour takes you through a top observation level, where you can look down on the factory floor. At every step of the way, there are short videos that explain what you are seeing below. There are even windows down at the little ones’ level so everyone can watch the fun. There are lots of fun things to view along the way. From smelling stations (to smell the different, popular flavors), to fun video games to “swat away” jelly beans, to fun games to sort the belly flops. One of the cool things you see in the factory is the Jelly Belly Art. 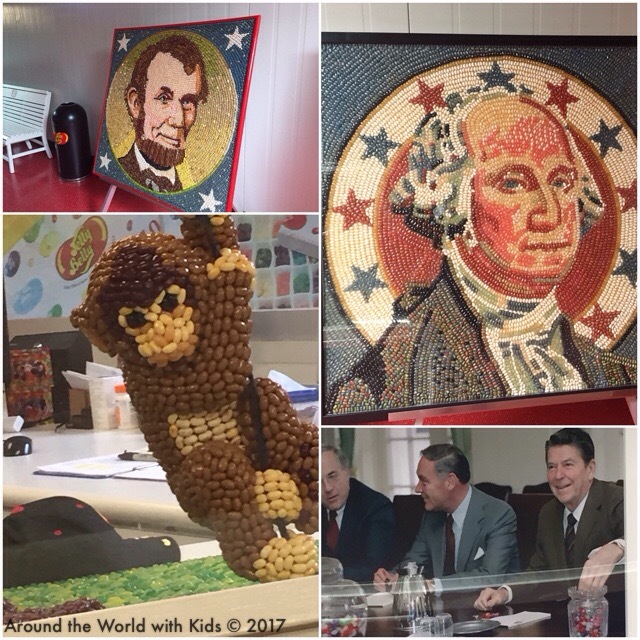 There are several mosaics on display throughout the factory of different portraits made of Jelly Belly’s. Due to Ronald Reagan’s almost “obsession” with Jelly Belly – over 3 tons of Jelly Belly were distributed in DC during Reagan’s inauguration, sending the astronauts with Jelly Belly’s on a space mission, he’s a favorite topic and we saw no less than 10 Jelly Belly art portraits. At the end of the tour we were all given a packet of jelly beans. But that wasn’t the best part. The best part was downstairs in the store at the sample bar! 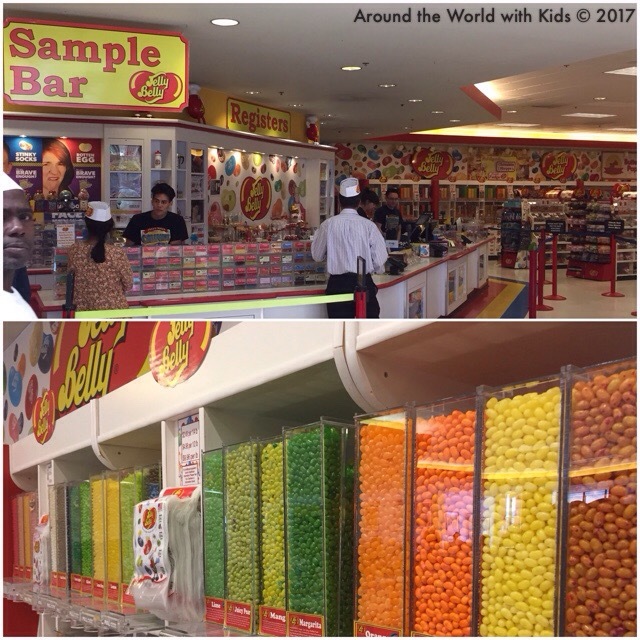 At the sample bar, each person was given the chance to try 3 flavors of any jelly belly or candy. 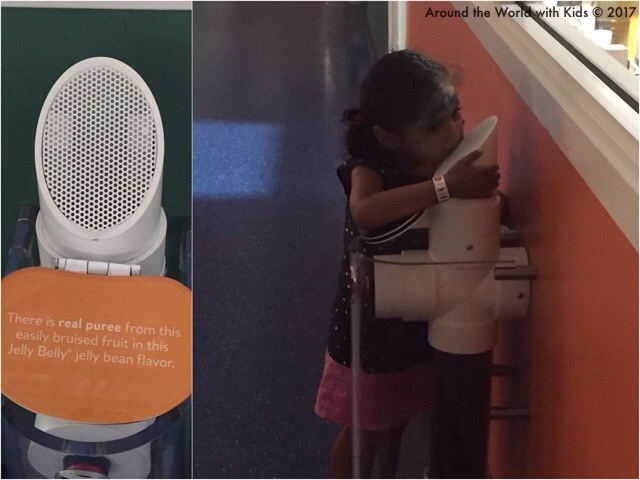 The kids had a fun time picking out flavors like bubble gum, smoothie blend, or very cherry. I tried a draft beer and cappuccino flavor. How can you pass up free samples? My husband however, was the bravest. 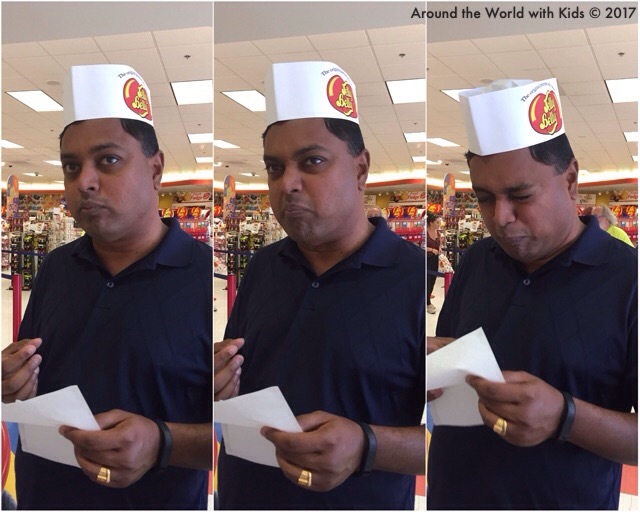 He decided to try one of the Jelly Belly beanboozled flavors. These are flavors that look like other popular flavors, but have a terrible taste. He purposely decided to try moldy cheese, thinking it might be like a Gorgonzola. As you can see…it didn’t work out so well for him. Turns out moldy cheese does NOT taste good. Who knew? After the sample bar, we spent some time walking the store to pick out some goodies to bring home. The kids immediately found the Troll’s branded bags to bring home. My husband and I, we decided to take just a few, of our favorite flavors home. About of pound of jelly beans later, we were ready to check out. The kids skipped out of the factory high on sugar and the fun of a spontaneous adventure on a Sunday afternoon. As we climbed in the car on the way to dinner, I reflected back on the beauty of the day, and the fun of a spontaneous adventure. It’s days like this that I live for as a parent: seeing the delight on my children’s face, and passing on to them a sense of adventure. Looks like a lot of fun – love all those strange flavours too! !